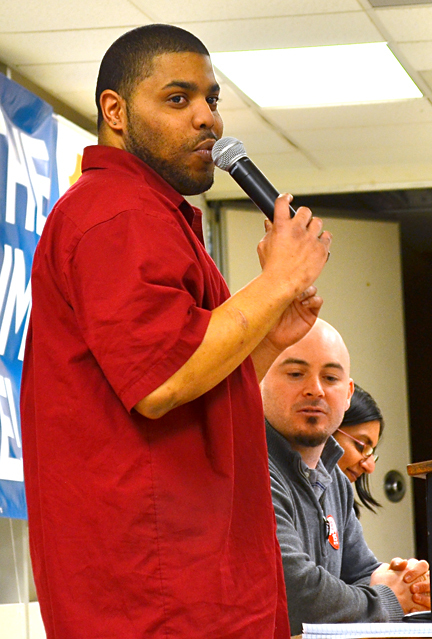 Kip Hedges, a baggage handler fired by Delta for publicly supporting 15 Now, spoke during the coalition’s meeting in Minneapolis Sunday night. 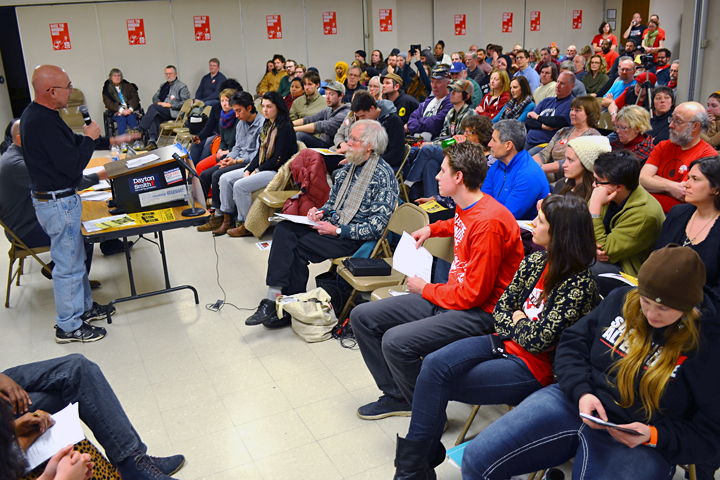 More than 100 activists gathered in a Minneapolis union hall last night to begin the work of raising the minimum wage within city limits to $15 per hour. Lest anyone suggest tempering expectations, 15 Now organizers invited Kshama Sawant, the city council member who spearheaded Seattle’s successful fight for $15 just over a year ago, to recount how labor, faith and community activists there turned an improbable goal into a reality for working people. Indeed, Seattle’s minimum wage will jump from $9.47 an hour to $11 an hour April 1, and it’s slated to reach $15 by 2021 at the latest. Sawant, an economics professor who upset a four-term incumbent on the Council, said the minimum-wage hike could lift as many as 100,000 workers out of poverty. 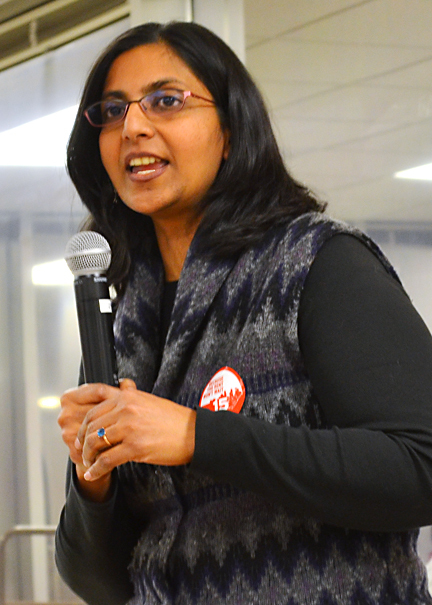 Seattle City Council Member Kshama Sawant addressed 15 Now supporters in Minneapolis. How did Seattle do it? Success in Minneapolis – as it did in Seattle – will depend on 15 Now’s ability to build a broad coalition of support, Sawant said. That means faith groups, community organizations and, of course, labor unions. A delegate to Seattle’s central labor council, Sawant said local unions in her city supported 15 Now out of a shared belief that a rising tide lifts all boats. Ubah Aden was among them. A member of the Service Employees International Union and a leader in her neighborhood, Aden wanted to “walk the walk” when it came to advocating for a higher minimum wage. So she quit a higher-paying job and took one in health care that paid $10.95 per hour. With two children monthly rent of $1,200, Aden found it impossible to make ends meet. “I couldn’t do it,” she said, adding that she quit the lower-paying job and went back to her previous field. No matter how broad a coalition 15 Now builds in Minneapolis, opposition will be fierce and well-financed, Sawant warned. In Seattle opponents lamented the impact of a $15 minimum wage on small businesses – a public-relations campaign underwritten, covertly and ironically, by the city’s biggest corporations. “Suddenly, you found Starbucks lamenting the fate of local coffee shops,” Sawant said. In response, 15 Now tapped into popular frustration with a global economy and political structures that seem rigged in favor of corporations and the very wealthy. In that sense, Sawant said, 15 Now builds on the message of Occupy Wall Street and the resistance of fast-food and retail strikers, offering a plan of political action to combat the growth of income inequality. Guillermo Lindsey, a McDonald’s worker, member of CTUL, said he usually works 55 hours per week with just one day off to spend with his family. If turnout for Sawant’s appearance is any indication, 15 Now already has a strong base of support from which to draw in Minneapolis. Two members of the Minneapolis City Council who attended the rally said they supported raising the city’s minimum wage. Alondra Cano of Ward 9 pledged to support $15 per hour; Ward 3’s Jacob Frey said he would support an increase, but needed more time to research how much. Several community organizations had a presence at the event as well, including the low-wage worker center CTUL and Neighborhoods Organizing for Change, a grassroots organizing effort for racial and economic justice in Minneapolis. “It’s time for us to stop settling for a minimum wage and start reaching for a living wage,” NOC Field Director Mike Griffin said. Ty Moore, a national organizer for 15 Now, pointed to an already-successful 15 Now campaign at Minneapolis-St. Paul International Airport – where a worker-led rally briefly shut down traffic on a roadway to Terminal 1 in December – as helping “boost the credibility” of 15 Now locally.